The exploits of Jack Cornwell at the battle of Jutland in 1916 offer a well-known story of gallantry in the face of adversity during the First World War. From humble origins, Cornwell joined the navy as a teenager and was stationed aboard HMS Chester at the Battle of Jutland. Within the first hour of hostilities he was hit by shrapnel and, despite being mortally wounded, remained stationed at his post. The ultimate sacrifice of Cornwell captured the public imagination during the challenging months of 1916. Among the many commemorations for Cornwell’s passing included a public funeral, a wax figure of the boy at Madame Tussauds, and the posthumous award of a Victoria Cross. Significant credence was attributed to Cornwell’s time as a member of the Scouts in forming the character traits that led to his dutiful demise. During his formative years Cornwell was a member of St. Mary’s Mission Scouts at Manor Park until the troop disbanded in 1914. The Chief Scout, Robert Baden-Powell, saw in Cornwell a sacrifice that would inspire other boys, with the creation of the ‘Cornwell Scout Badge’ awarded to boys who carried out acts of heroism. There was, therefore, “perhaps no boy more famous, nor more extensively commemorated, during the First World War than John [Jack] Travers Cornwell”. Compared to the story of Cornwell, the tale of another boy seaman at Jutland, William Walker, has been largely overlooked. 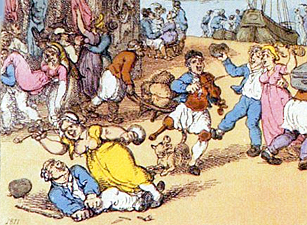 The experience in the formative years of Walker – known to his peers as ‘Young Bill’ – are similar to those of Cornwell. Walker was from a humble background and joined the navy at a young age after spending time in a uniformed youth movement in the capital prior to the outbreak of war. Walker was a member of the 4th London Boys’ Brigade Company where he became adept at bugling. It was not unusual for a member of the Boys’ Brigade in London to take up this instrument, with bugle bands the most common marching band in the pre-war years, and activities in the capital characterized by drill and martial music of the bugles. Walker’s experiences in the 4th London Company stood him in good stead when he joined the navy where he became a bugler aboard HMS Calliope at the Battle of Jutland. “The conduct of Boy Walker should be made known to his comrades throughout the Brigade, and his gallant devotion to duty should be an example to us all”. However, the response of the Boys’ Brigade to ‘Young Bill’ was reserved when compared to the Scouts and their commemorations of Cornwell, where his exploits were utilized to invigorate the movement during the war. The response of the Brigade is indicative of an organization that was less confident in itself during the war than its Scouting brothers. This was, in part, due to the passing of the founder – William Alexander Smith – months before the outbreak of war and the uncertainties resulting from the prospect of accepting cadet recognition from the War Office. Therefore, the experience of these boys in battle provides an insight into prevailing attitudes towards youth, the role of youth movements in wartime, and the masculine ideals of duty and discipline that were encompassed in the navy. Richard Davenport-Hines, “Cornwell, John Travers [Jack] 1900 – 1916”, Oxford Dictionary of National Biography, (Oxford: Oxford University Press, 2004), online ed. [http://oxforddnb.com/view/article/45719, accessed 15 February 2016]. Davenport-Hines “Cornwell”; Mary A. Conley, From Jack Tar to Union Jack. Representing Naval Manhood in the British Empire, 1870 – 1918, (Manchester: Manchester University Press, 2009), 160. “Boy William Walker”, The Boys’ Brigade Gazette, vol. 25, no. 3, November 1916, 29 – 30; 29. In the 1913-14 session two-thirds of all Boys’ Brigade bands were formed of bugles. See Anon, Banging the Drum. The Story of Boys’ Brigade Bands, (London: Boys’ Brigade, 1980). For an assessment of the situation in Glasgow see Chris Spackman, “Port Town Pipers of the Glasgow Battalion”, Port Towns & Urban Cultures Website, last accessed 18 February 2016, porttowns.port.ac.uk/port-town-pipers. Donald M. McFarlan, First For Boys. The Story of The Boys’ Brigade 1883 – 1983, (London: Collins, 1982), 50. McFarlan, First For Boys, 50. “Boy William”, 30; McFarlan, First For Boys, 50. 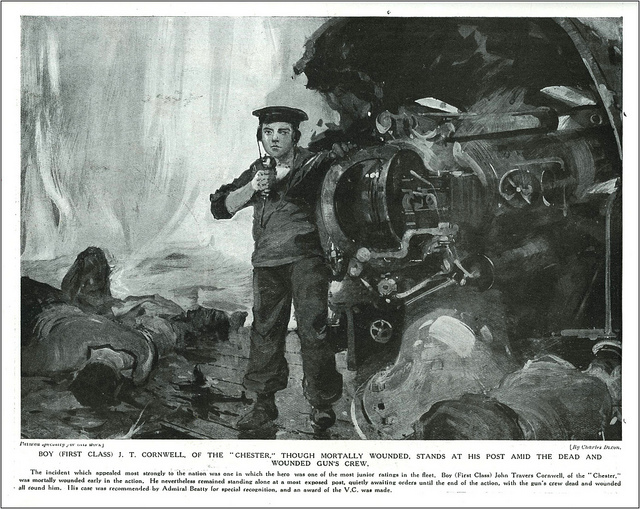 “Another ‘Boy Cornwell’ in the Jutland Battle”, Daily Sketch, 18 October 1916. Rosie Kennedy, The Children’s War. Britain, 1914 – 1918, (Basingstoke: Palgrave Macmillan, 2014), 106 – 107; John Springhall, Brian Fraser, and Michael Hoare, Sure and Steadfast. A History of The Boys’ Brigade. 1883 – 1983, (London: Collins, 1983), 115 – 116; Roger S. Peacock, Pioneer of Boyhood. Story of Sir William A. Smith, Founder of the Boys’ Brigade, (London: Boys’ Brigade, 1954), 126. Dr Chris Spackman is a part-time tutor in History at the University of Portsmouth working under the Port Towns and Urban Cultures Project. His thesis examined the relationship between the Boys’ Brigade and urban cultures in late nineteenth and early twentieth century Britain. Through a case study approach of the port-side locations of London, Bristol, and Glasgow his thesis assessed both regional and national variances in the application of the object of the organisation. In particular, Chris’ research afforded special attention to the leisure pursuits undertaken by the movement. Through his case study approach Chris’ thesis offered a challenge to the historiographical consensus that purports that camping, rather than the regular weekly sessions, was the greatest attraction available to members of youth movements. This is the fitting blog for anybody who wants to search out out about this topic. You understand so much its nearly arduous to argue with you (not that I really would need…HaHa). You undoubtedly put a new spin on a subject thats been written about for years. Nice stuff, just nice!